The Euro Series returns to the WSK calendar after a few seasons without. 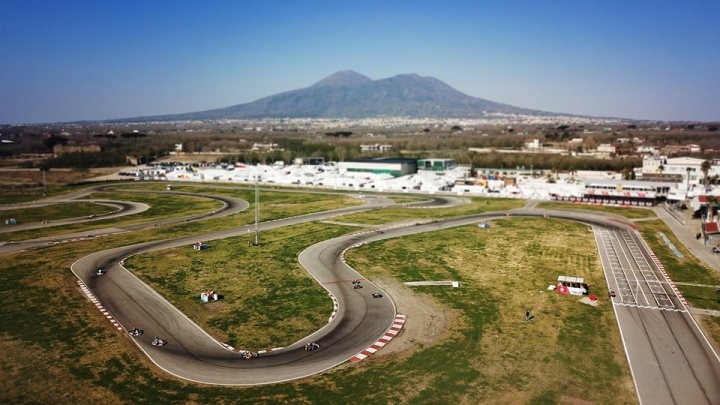 The Circuito Internazionale di Napoli is the setting for the start of the series with the first of the four scheduled rounds. On the day dedicated to the fight against the clock, many pole positions were assigned for the categories present. Lorenzo Camplese continues his positive streak in Sarno after the good performances of the Super Master Series weekend. The Italian stops the clock at 56.286, valid for the absolute pole position and the record of group A. In second place, poleman of group B, the first of Sodi, namely Adrien Renaudin, one step away from the best absolute performance. Last two pole positions assigned to homeboy Francesco Celenta, pole group C, and Alex Irlando at the top of group D.
With the new colors of the Sauber Karting Team, Dexter Patterson doesn't skip a beat in this first issue of the Euro Series. The Scottish Champion imposes himself in an OK that is poor of participants, but still full of battles at the top; behind him, the excellent Dino Beganovic takes the second absolute position. Third time for Nikolas Pirttilahti; Matheus Morgatto and Kirill Smal close the top five. Seventh and eighth time for Minì and Travisanutto; qualifying without a time for the returning Janker. The Tony Kart starts well in Sarno with a revived Nikita Bedrin, author of the absolute best time (59.143); close behind, his new companion Alex Dunne on pole for group B. The driver of Singapore, Christian Ho, surprises, able to place himself on top of the list of times with the third absolute chrono and the record for group C. Last two pole positions in the hands of Lorenzo Ressico D’Aloisio and James Wharton, respectively in group D and E.
Five more pole positions for the very young Mini drivers, led by the ever competitive Alex Powell. The Jamaican driver will immediately try to improve his third place in the Super Master Series, starting in front of group A. Second and third time attributed to Kenau Al Azhari and Kirill Kutskov; closing the top five are Andrea Filaferro and Douwe Dedecker.